Chile’s top sommelier shares favourite vintages from his homeland. Chile’s top somm Marcelo Pino. Although he cut his teeth – as well as plenty of raw fish – as a sushiman at Santiago de Chile’s Ritz-Carlton, Marcelo Pino made a professional about-turn in 2007 and turned his hand to wine. The decision was a wise one: in 2011 he was anointed Chile’s top sommelier, and he represented his country at the A.S.I. Contest of the Best Sommelier of the World in 2013. Here, Pino selects his top five Chilean wines. One of Chile’s most iconic grapes, this Concha y Toro Cabernet Sauvignon is also an emblematic Chilean wine. Its first harvest was in 1987, and the most recent available from 2010. 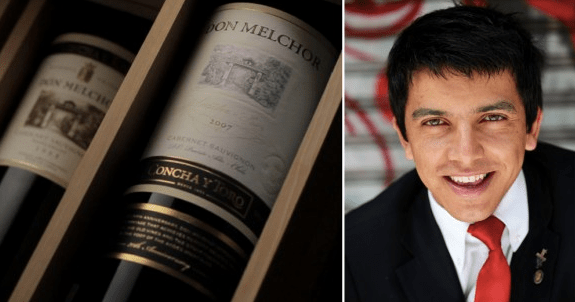 Although it comes from the world’s third-largest winery, there’s a great concept behind Don Melchor. Coming from poor soils with a lot of stones, it comes up very aromatic and expressive with lots of elegance that characterises a Maipo Cabernet – red fruit, fresh when they are young, with lots of spices. There’s also a lot of menthol and cedar, and light, silky tannins. It has an important price-to-quality ratio and has picked up a lot of awards. Unpretentious, tremendous. Best paired with fillet steak. This is one of my favourites, because it’s made from the País varietal, a red grape that used to be considered rather rough and was used to make low-quality wine. But it was subject to a rescue mission, and Miguel Torres was one of the pioneers working with producers to improve it – it’s also fair trade. A special Champenoise-style sparkling wine that spent six months on its lees, it’s won lots of awards. Its acidity is tremendous; it’s extremely fresh and reminds you of fresh strawberries and raspberries. It’s a great example of a sparkling rosé and can be drunk as an apéritif – I can see it being enjoyed at a ladies’ gathering! This Chardonnay is from Chile’s southernmost valley, Valle Malleco; it’s a cold place. It has a lot of minerals and plenty of fruit; it’s a complex wine you can age for five or six years and will keep on improving. Several years ago, it was unthinkable to consider that a wine of such high quality would come from this region, but Aquitania’s oenologist Felipe de Solminihac has done some amazing work with this vineyard to produce a Chardonnay that can stand the test of time. It’s very versatile, and goes well with oily fish such as tuna, salmon and trout as well as white meat. Colchagua Valley is globally renowned for its red wine, but particularly for Carménère, a grape that likes the heat but is sensitive to the cold. Casa Silva is one of the wineries that has undertaken a lot of research into finding out what works best for this plant. The Gran Terroir comes from a 50-hectare vineyard called Los Lingues at the foot of the Andes that was planted in 1997; Carménère works well in this alluvial soil with good drainage. It’s very representative of the varietal – lots of black cherry, plums, berries, with a touch of eucalyptus. Its tannins are well-rounded, mature and elegant; that’s the seductive part of a Carménère. Goes well with pizza, pasta and Chilean empanadas. This varietal has been receiving lots of praise recently. It’s got a fresh acidity and is very juicy with slightly rustic tannins, but these wines can be stored for a long time. This Carignan is made by a pair of young oenologists looking to change the world’s image of Chilean wine to create something fresher, with a distinct use of oak. I really like this well-worked Carignan – it’s complex with great acidity, and it’s elegant – its tannins are fine yet abundant with lots of structure. It’s a great, inexpensive wine with fruits of the forest, black pepper and cardamom, and well-integrated wood. Pair it with a rib-eye steak, skirt steak or lamb.